Although Washington continues to state that the leaders of the United States and North Korea can still meet in Singapore, it is clear that there will not be a summit. It will either be postponed, or will not take place at all. 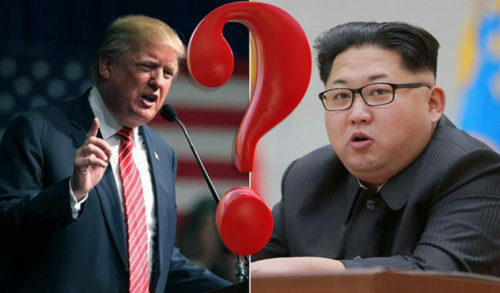 Washington continues to state that the meeting of US President Donald Trump and DPRK leader Kim Jong-un in Singapore on June 12 "can still take place". However, the American leadership itself does not believe in such an opportunity and is looking for ways to explain this failure to its own and the world public. Make an honest confession that they themselves caused the collapse of the Singapore summit, above the forces for the Trump administration. Perhaps they even sincerely do not understand this. Therefore, they began to look for the guilty on the side. And quickly found: they are Chinese and South Koreans. Russia's complete non-participation in the disrupted Singapore adventure does not yet allow Americans to point a finger at it. But that does not mean anything - if they want, they'll do it. Trump explains the failure of the summit by Pyongyang's reluctance to fulfil certain preconditions, which are actually a refusal to bow before the impudent US demands even before the talks begin. It can be seen that the US President presents them as the surrender of Pyongyang as his triumph, as granting him the right to decide not only the fate of North Korea but also his counterpart in negotiations. And at the same time, he claims that for the DPRK this is "a chance to become a great country". Very revealing in this regard is the statement of US Vice President Mike Pence, who demanded from Kim "not to make a big mistake" and "not to play" with Trump, but immediately surrender. For refusing to surrender, he threatened Pyongyang with both military and "Libyan" scenarios. How can Pyongyang take seriously his negotiating partner, especially after the US withdraws from the international nuclear deal with Iran, and Kim - to go to disgrace at the far end of the world to Singapore, if Pence openly declares that the US "never excluded the military option" to resolve the Korean conflict and that if the DPRK does not go to the talks, then it is still possible the Libyan scenario. Comments are superfluous. What kind of "negotiations" can be, if one of the parties is so brazenly and behaving in a boorish manner? None. So only surrender occurs. But for this, the US must first defeat the DPRK. Americans may not genuinely understand that, without giving the negotiating partner the opportunity to save face, they themselves make negotiations impossible. And the White House spokeswoman Sarah Sanders says that if in such circumstances the North Koreans "want to hold a meeting, we will certainly be ready." "Our goal is to achieve the full denuclearization of the Korean peninsula," Sanders repeated once again. Of course, she did not explain what kind of security guarantees the DPRK will get if Washington and Seoul continue military manoeuvres off the North Korean borders, preparing for a war with the North, and what economic and other dividends Pyongyang is relying on for abandoning its nuclear missile shield. What the eminent representatives of the US administration said on this score is more reminiscent of the establishment of Washington's tight control over the North Korean economy. To then decide the question, whether to change the regime of the DPRK or not. On this score, Washington makes contradictory statements. It is clear that they will never be able to trust the dictator Kim. Therefore, if the DPRK gets into American paws, the leader of North Korea could not expect anything good. Whom did Washington designate as scapegoats? Americans do not like to admit their mistakes, so the search for the perpetrators of the failure of the upcoming Singapore summit has already begun. Especially it does not like Trump - as a very typical American. "I think there was a change in attitude from Kim Jong Un after his meeting with Xi. There was a difference after Kim Jong. President Xi is a world class poker player. Maybe nothing happened, I'm not blaming anybody. But there was a different attitude from the North Korean folks after that second meeting. "- Trump said on Tuesday during a meeting with South Korean President Mun Zhe In. Noting that the meeting between the leaders of the DPRK and China was a surprise to everyone, the president of the United States named the president of the PRC a master 'poker player', referring to the North Korean leader Kim Jong-un's attitude in talks with the United States of America. On Monday, Trump, through his Twitter, urged China to strictly control the border with North Korea until it reached an agreement with Kim Jong-un. Trump accused the PRC of easing the sanctions regime against the DPRK, fearing that this would strengthen Pyongyang's intention to resist the insolent American demands. It seems that he also accused Xi of insincerity and that he, along with Kim, took advantage of the clumsy work of American "diplomacy" in an attempt to bring the DPRK to its knees before any negotiations, and that they now let Washington know that under such conditions no summit will be. Everyone knows that China accounts for over 90% of North Korea's trade, so only Chinese sanctions could force Pyongyang to make concessions. But after Trump, Pence, Pompeo and US National Security Advisor John Bolton, who also threatened Kim with a "Libyan model," broke so much firewood, Pyongyang and, most importantly, Beijing, had an "alibi" to continue economic cooperation. Americans can not admit the failure of their own policy, that's why they all chew on the cunning Chinese "world class poker player". But one of the culprits for the failure of the summit, on which the whole world had high hopes, is still not enough. Even if they are Chinese. Therefore, in Washington decided to add to them and the South Koreans. The "guilt" of the latter, first of all, President Mun, consists allegedly in the fact that they misled the US leadership, greatly exaggerating the DPRK leader's readiness for denuclearization. Итак, встреча Трампа и Кима, скорее всего, не состоится вообще. Китай и Северная Корея обзавелись «алиби» для продолжения экономического сотрудничества, продемонстрировав всему миру свою лояльность. Everything returned to the situation before the North Korean sanctions were tightened in connection with Pyongyang's nuclear missile program, which was completed after the fulfillment of the goals set before it. Pyongyang has the minimum arsenals of nuclear missiles that are necessary for US containment. And for Kim this is quite enough. The fact that Seoul agreed to the resumption of the South Korean-American maneuvers shows that Washington fully controls South Korea and will not allow its unification with the North. A strong, united Korea will not need American patronage, and the US can then lose an important springboard against China and Russia. China's actions also show that it is actually interested in maintaining the status quo in the region, but without further North Korean nuclear tests that are irritating the United States and the whole world. Beijing is not at all pleased with the prospect of the emergence at its side of a powerful regional power, in fact, "mini-China." Especially if the US is hosted in this country, as now in South Korea, then it will be a complete catastrophe for Beijing. Japan will breathe a sigh of relief, because United Korea (in case of the DPRK's surrender, its emergence is inevitable) will be a deadly competitor for it, even more than for China. Especially since Koreans have a lot of historical claims to the Japanese. The latter are worried about Pyongyang's nuclear weapons, but if Kim behaves quietly, and it will simply perform the role of "insurance" against an attack by the US, then this can be easily reconciled. This will be the lesser evil. Russia, too, is unlikely to like it very much that in the Far East, where it has only seven million people, another powerful military and economic power will emerge with almost 80 million people and with its own geopolitical claims. A very big question is whether, in fact, both Korean elites are really interested in the merger. Do southerners need a strong headache associated with this? Will the odious North Korean regime agree to voluntarily go to the "dump of history"? Hardly. Most likely, everyone will want to preserve the status quo, only in a calm manner. Therefore, no one will be greatly upset because of the failure of the summit of Trump and Kim, although there will be enough speculation on this score, as well as those wishing to take advantage of the current stalemate.